Fuel Cell is a very advanced pollution free technology used to generate electricity. Unlike batteries, fuel cells can generate electricity as long as source of fuel is supplied, providing up to 3 times more efficiency than combustion technologies. China being the major manufacturing hot spot in the world lags behind the developed countries such as U.S, Japan and Korea in terms of producing and implementing fuel cells. China hasn’t found the profitable use of fuel cells yet as the current price of fuel cells is too high and present infrastructure needed to support its commercialization is not developed too. But the Chinese market there is an immense, latent need for alternatives f energy sources. It is expected when the price of fuel cells approach parity, Chinese fuel cell market will become largest in the world. Goldstein Research analyst forecast the China Fuel Cell market to grow at a CAGR of 11.7% during the period 2016-2024. Further, the China Fuel Cell market is predicted to reach USD 3.8 million by the end of forecast period. The Chinese fuel cell market is majorly occupied by the domestic suppliers, of which Dalian Xinyuan Dongli reported the highest revenues. 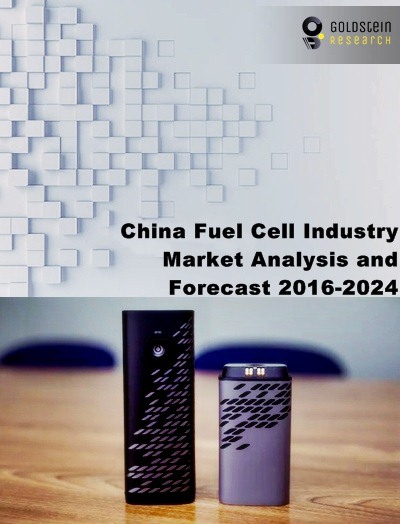 The report covers the present ground scenario and the future growth prospects of the China fuel cell market for 2016-2024 along with the total sales of fuel cell products in every region. We calculated the market size and revenue share on the basis of revenue generated from the sales of fuel cells to various end user industries across the China. China Fuel Cell Market Report 2016-2024, has been prepared based on an in-depth market analysis from industry experts. The report covers the competitive landscape and current position of major companies in the China fuel cell market. The report also includes porter’s five force model, SWOT analysis, company profiling, business strategies of chinese fuel cell companies and their business models. China fuel cell market report also recognizes value chain analysis to understand the cost differentiation to provide competitive advantage to the existing and new entry players. This market report comprises of the following chinese fuel cell companies as the key players in the China fuel cell market: AFC Energy, Aisin Seiki Co. Ltd., Ballard Power Systems Inc., Bloom Energy, Ceramic Fuel Cells Limited, Ceres Power Holdings PLC, Doosan Corporation, Fuelcell Energy, Horizon Fuel Cell Technologies, Hydrogenics Corporation, Kyocera, Panasonic Corporation, Plug Power Inc., Toshiba Corporation, Dalian Xinyuan Dongli, Jiangsu Huayuan, Shanghai Shenli and Shanghai Boneng. On the basis of fuel cell, proton exchange membrane fuel cell (PEMFC) accounted for the highest revenue share of 68% in China fuel cell market owing to its portable use. Moreover, proton exchange membrane fuel cell segment is anticipated to continue its dominance with a CAGR of 12.4% over the forecast period. According to our China Fuel Cell market study on the basis of extensive primary and secondary research, one of the major trend that driving the growth of fuel cell market is the shift of automotive industry towards the clean and environment friendly fuel technology. Automobile manufacturers are now finding new possibilities for the green transportation with the implementation of electric vehicle and fuel cell technology. According to the report, major driver in China Fuel Cell market is the implementation of fuel cells in electric vehicles, which hold the major market in China. One of the most promising industries is electric vehicles for the growth of fuel cells market in coming years. Approximately 15 million battery powered bikes were sold in China in 2016, the world’s largest electric bike market. Forklift trucks also present huge growth opportunity as they require a long steady discharge from their batteries, which makes them suitable for the fuel cells. Further, the report states that one challenge in China Fuel Cell market is high cost of fuel cells in China as compared to the conventional power sources. The 240 watt lead-acid battery costs around USD 300, whereas a typical fuel cell produces 220 watts costing ten times this amount. What are the recent developments and business strategy of chinese fuel cell companies? 8.2.3. Aisin Seiki Co. Ltd.